(Kansas City, Mo. – April 9, 2018) The Kansas City Area Transportation Authority (KCATA) has been awarded a Small Starts grant from the Federal Transit Administration in the amount of $29.9 million. 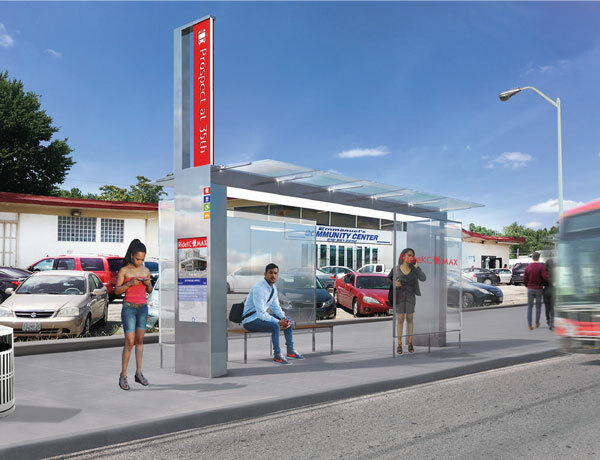 The grant will be used to begin construction on the new Prospect MAX that will bring improved transit service and economic development to the Prospect corridor. “We are excited about the technology and economic development that Prospect MAX will bring to the region,” said Robbie Makinen, President and CEO of the KCATA. The new Prospect MAX will feature interactive kiosks with real-time arrival information, public WiFi, ticket vending machines, level boarding platforms, and reduced travel times. The service will also bring new mobility hubs to 12th & Charlotte, 31st & Prospect, and 75th & Prospect. Mobility hubs will bring increased economic development and transit choices along the Prospect corridor. According to the FTA Administrator, Jane Williams, the Prospect MAX is the fourth project to be awarded. KCATA has partnered with the City of Kansas City, Mo. and the Federal Transit Administration to bring this new transit service to the region. “We’re grateful to our congressional delegation for their ongoing support of public transportation and our partners at the Federal Transit Administration,” said Makinen.